I’m a big fan of British recipes as you may know – and I think we should do everything that we can to preserve them, especially the hidden gems that are regional specialties. Goathland is a tiny village – population less than 500 – tucked away in the North York Moors National Park, just south-west of Whitby. It looks an absolutely delightful place, and Harry Potter fans will recognise Goathland Station as doubling for Hogsmeade (the station nearest Hogwarts) as well as Aidensfield from the popular TV series Heartbeat. In the 1930s, Mrs Arthur Webb was commissioned by the BBC to visit farms throughout the UK “in order to secure something that was characteristic of its cooking and preparation of food.” In much the same way a her contemporary, Dorothy Hartley, would – Mrs Webb tramped around the countryside conversing with farmers wives and watching them cook in their own kitchens, frequently with awe and respect. I looked at the fireplace. I watched the flames travelling under the oven. Luckily for us, Mrs Webb was able to jot down the ingredients for this fantastic tart, which I have only tweaked very slightly in converting to metric measurements and adding cooking times/temperatures. I’m curious to know which farm in this peaceful area was the origin of such a flavour-packed bake. As you can see from the photograph. it bears little resemblance to the traditional British, tooth-achingly sweet, open-topped Treacle Tart made with golden syrup and fresh breadcrumbs. 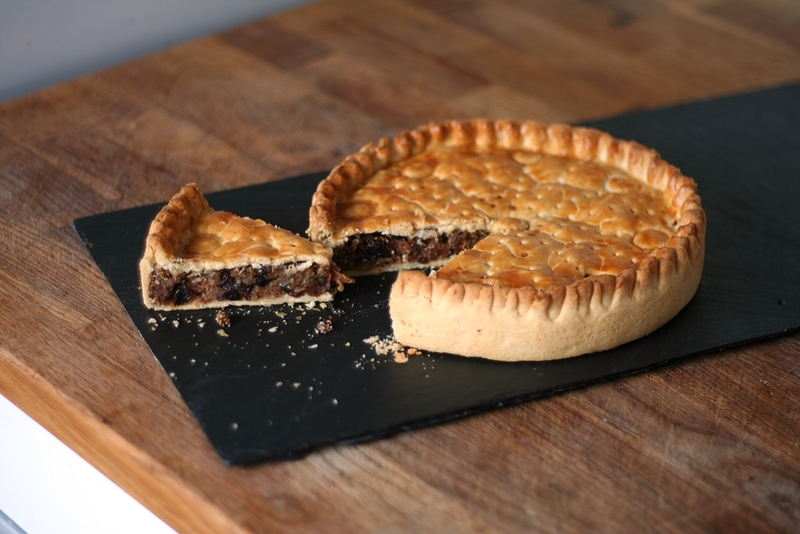 Whilst still containing breadcrumbs, the filling for this double-crust tart is packed with fruit both fresh and dried, actually contains treacle, and is much closer in taste to a traditional mincemeat, although blessedly fat-free. Along with the dried fruit and spices, the filling is given some fresh zing with chopped apple and lemon zest/juice. The dry breadcrumbs absorb any apple juice during cooking, resulting in a tart with a firm, fruity filling, no soggy bottom, and packing a huge wallop of flavour. The lack of fat in the filling means that the taste is bright and fresh and never cloying or overly rich. I’ve chosen to wrap this in my favourite cornflour shortcrust, as its dry crispness when baked is the perfect foil against which the filling can really shine. Which is all well and good, except that when it comes to decorating, I usually have the patience and finesse of a potato. But I also have a little imagination, so I created the above decoration for the tart lid, in the best traditions of housewives across the years, with what I had to hand: namely, a teaspoon, an apple corer and a skewer. 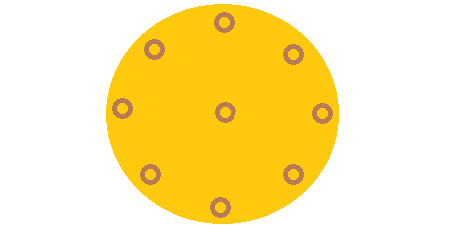 The pastry was crimped by laying the pastry lid as per the above diagram, so that the edges lay vertically against the sides of the tin. Insert the handle of a teaspoon between the outer edge of the pastry and the tin and your finger and thumb against the inside of the pastry. Press inwards with the spoon handle as you pinch the two pieces of pastry together. I had intended only to hand-crimp the tart edges, but the imprint of the teaspoon handle has made a pretty design, so I’m going to run with it. *lying* I totally meant to do that. The pattern was made firstly by gently pressing an apple-corer into the lid – enough to mark, but not enough to cut all the way through the pastry (see pic below). Then I used a wooden skewer to poke holes in lines from the centre ring to each of the surrounding rings (see pic below). 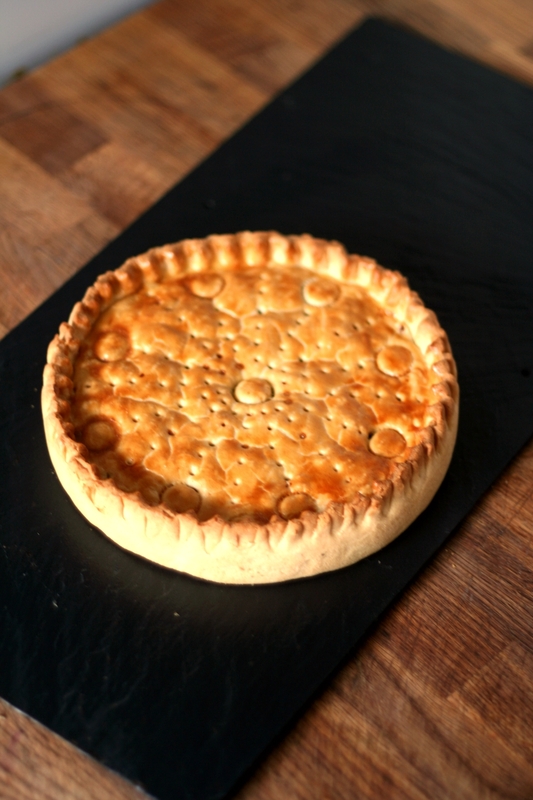 If you’re in any doubt whether or not to try this tart – and I really hope you will – let me just say that I’m seriously considering using this as my mince pie recipe this year. Chill while you mix the filling. Mix the breadcrumbs, dried fruit, candied peel, spices and lemon zest in a bowl. Warm the treacle by placing the open can in a saucepan of water over a low heat. As it warms, it becomes less viscous and easier to pour. Pour out the required amount of treacle and mix with the lemon juice, then add the milk afterwards. NB Don’t mix the lemon juice with the milk first, otherwise it will curdle. Add the liquids and the chopped apple to the rest of the ingredients and stir to combine. Add the filling to the chilled pastry case and smooth over. Roll out the remaining pastry to make the lid. Wet the edges of the pastry with water, and lay the pastry lid onto the filling. Ease the edges together as per the diagram above. Make sure there’s no air trapped underneath the lid – in the oven this air will expand in the heat and may cause the lid to lift away from the filling. Use the back of a knife (so as not to scratch your non-stick tin) to trim away the excess pastry, then crimp the edges as described above. Brush with beaten egg, or with milk and then sprinkle with a little caster sugar. (I used just egg). Bake for 30 minutes, turning the tin around after 20 minutes to ensure it colours evenly. After cooling for 10 minutes, if you’ve used a loose-bottomed tin, the tart can be gently removed and served, or set onto a wire rack until cold. These must be really dry. Definitely not fresh. If you have none to hand, nor any stale bread, make breadcrumbs of 3 slices of bread and lay them on a parchment-lined baking sheet. Dry (without browning) in a 120°C 100°C Fan oven for 20-30 minutes. Am going to give this a whirl, but will use Syrup instead of Treacle, as hate it. Will let you know how it turns out. My Mum, cooked on a back to back Range, the Fire was in the Living Room, the Oven, backed on to it, in the Kitchen. Mum, would put a piece of Paper in the Oven, and what colour it turned, determined what she cooked. She was a wonderful Baker, and never saw her Weigh anything. We had a back up for the Summer, an Oil fired Cooker, which she also cooked on. I love your take on William Morris! And I really like your decoration, too – it looks just right.